To find local storytelling groups or meetings, click here. On this page, you will find links to Storytelling Association of California members who have chosen to list their talents on this website. NOTE: Inclusion on this list is not intended as an endorsement or guarantee. We recommend that other references be checked before committing to a contract with any performer. Fees and contract requirements may vary widely. Storytellers: Please send a us a brief description and the URL for which you want the link to direct those interested and it will be embedded in your listing below. Send to Shags@att.net. Bill Amatneek - "Acoustic stories" from the world of the folk musician. Sara Armstrong - Storyteller, digital storyteller, educator. Joel Ben Izzy - Traveling storyteller and author. John Boe - Stories, essays, and poems. Beatrice Bowles - World Wonder tales for children. David Chittenden - Orange County, California storytelling. Willy Claflin - Willy Claflin and Maynard Moose: The Antler is Blowing in the Wind. Cassandra Cushing - Kaleidoscope: Coffee that tells a story. Catherine E. Dana - Storyteller. Enid Davis - Silicon Valley Storyteller, storytelling teacher, and children's librarian. Lucinda deLorimier - Positive world change through active narrative. Francie Dillon - Touching hearts, changing lives one original, funny, inspiring story at a time. Tim Ereneta - Traditional fairy tales, told for contemporary audiences. Jean Ellisen - Stories for all seasons - and all reasons. Cathryn Fairlee - Cathryn travels and tells and teaches folk fascinated by long traditional tales. Tom and Sandy Farley - tandem storytelling and story theatre for all ages. Pam Faro - Colorado storyteller Pam Faro has been performing, teaching, and delighting audiences for 25 years nationally and internationally! Diane Ferlatte - Tales from many cultures, with African, Southern, and African-American roots. Kenneth Foster - Storyteller in north San Francisco Bay Area. Grace "Megumi" Fleming - Japanese storyteller - folktales and more! Jeff Gere - Entertains audiences in Hawaii and produces the Talk Story Festival there. Robert Green - Lifelong Financial Navigation. Malcolm Grissom - Comedian and storyteller. Ruth Halpern - Tales of adventurous heroines and stories brought to life with words and dance. Zette Harbour - storyteller, writer, speaker, business consultant bringing empowering, inspiring and evolving stories to life. Craig "Hackin' 'Boo" Harrison - Craig “Hackin’ 'Boo” Harrison tells tales of humor and humanity. Mary Ellen Hill - experience the wisdom, magic, and power of storytelling. Laura McHale Holland - Stories to evoke, enliven, engage! Muriel Johnson - Stories for children...and more! Larry Kluger - Cowboy rope spinning and tales of the "Wild West." Audrey Kopp - Shares folktales from all around the world and includes audience participation. Karen Rae Kraut - Storyteller, Teaching Artist, former SAC Board Member. Erica Lann-Clark - One of America's feminist Jewish folktellers, storyteller, and playwright. Michael Litzky - Storyteller, creator of heartwarming children’s adventure serials with Willy the Wolf and Francesca the Flying Squirrel, and teller of folk tales from around the world. Angela Lloyd - Building community through story, poetry, and song. Olga Loya - Bilingual storyteller shares personal stories, folklore, and historical stories. Jacqueline Lynaugh - Storyteller/musician Jacqueline Lynaugh performs tales with music in costume for adults and children using guitar and harp. Ross Mackinney - Ross is a member of the Northcoast Storytellers Guild. Lance McVay﻿ - Lance tells stories of his own design that have an old-world style. Marie Minder - business storytelling for sales, job candidates, presentations. Monterey Public Library - Jeanne McCombs of the Monterey Public Library supports storytellers with year-round programs for the Monterey Bay communities. Liz Nichols - Storyteller, TimeSlips Trainer, TimeSlips Creative Group Storytelling. Bill Ratner - Bill is one of America's leading storytellers and voiceover performers. Ann Riley - Traditional tales and stories of Spirit. Houston Robertson - Storytelling for adults. Houston specializes in storytelling that focuses on the renaissance aspect of growing older. Her stories and her one woman show, Victory for the Recycled Virgin, entertain and inspire. Sheila Rubin - MA, LMFT, RDT/BCT, Drama Therapist; developed and has been teaching Embodied Life Story storytelling workshops in the Bay Area since 1992; developed a program for young children with music and storytelling. Marilyn Rudzik - Volunteer Producer/Director, Mariposa Storytelling Festival. BZ Smith - Storyteller and storytelling mentoring, specializing in early childhood audiences, special needs audiences, and environmental education. Barry Spector - Myth - Poetry - Ritual. Our Annual Day of the Dead Ritual: November 1st. Elaine Stanley - Weaver of Stories for Head, Heart and Soul. Ruth Stotter - Folklorist and storyteller. Kirk Waller - Folk tales, African-American Stories, multicultural tales, and personal stories. John Weaver - Storyteller and early childhood professional. Karin Werner - Stories of myth, memory and magic. 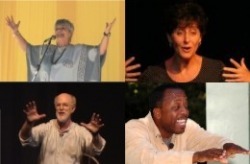 Linda Wright - Linda enchants audiences with historical tales, African tales, and monster tales to all ages.